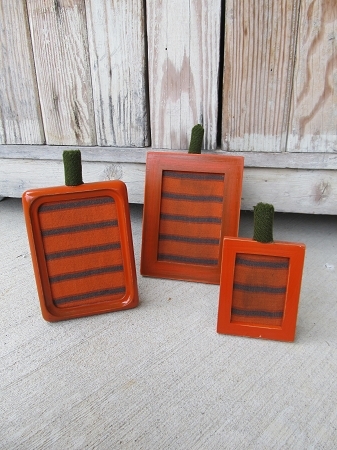 Primitive Set of 3 Pumpkin Frames. A unique creation made up by my Mom Lynn. She's taken 3 different size/shape frames and painted and decorated them to look like pumpkins! How cute. Display them in the set of 3, or scatter about. Each has an easel back so they stand up nicely. Vintage wool stems. What a unique and fun piece to decorate with this fall. Sizes are: 8"x5", 7 1/2" x 4 1/2", and 5 1/2" x 3 1/4". A one of kind by Lynn.